The National Weather Service's National Storm Surge Hazard map of Puerto Rico. The National Weather Service’s National Storm Surge Hazard map of Puerto Rico. The storm is expected to reach Puerto Rico between Tuesday and Wednesday, as a Category 5 hurricane, which could represent catastrophic damage for the island. In preparation, Rosselló activated the National Guard and urged citizens to evacuate flood-prone areas as Hurricane Maria approaches. 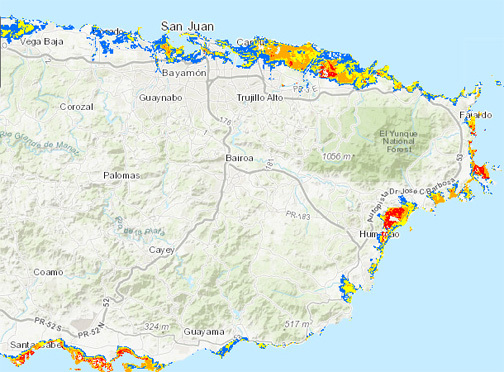 According to the National Weather Service, Puerto Rico’s flood-prone areas are mostly along the northern coast, from San Juan to Luquillo. Puerto Rico has not seen the threat of a hurricane of such magnitude since 1928, when Hurricane San Felipe struck. Hurricane Maria is expected to bring with it winds of 150 miles per hour, between 12-18 inches of rain and 25-foot storm surge. “We are informing citizens that it is time to seek refuge with a family member, friend, or move to a state shelter because rescuers will not go out and risk their lives once winds reach 50 miles per hour,” he said. The Puerto Rico Housing Department reported that there are 450 shelters with space for 62,714 people. See updated list HERE. Hey Buddy!, I found this information for you: "Rosselló declares state of emergency ahead of hurricane". Here is the website link: https://newsismybusiness.com/declares-emergency-hurricane/. Thank you.